Dugo, Kusterle, Valvassori. Three Stories From the Border. The idea of bringing together three artists, with diverse characters, and very different approaches to their work, dissimilar forms of expression and even understanding of art, but with a shared location of habitat, i.e. in the vicinity of a border, led us to contemplate whether we can compare them and find a shared tension within them and their work, i.e. a desire to see further, beyond the border, which all three artists see as a challenge and thus a reason to expand rather than restrict. The work of each one of these three artists was juxtaposed in relation to the border on numerous occasions: in his text on France Dugo’s work Marco Goldin mentioned ‘the border as an existential state’; in his thoughts on the artistic development of Giorgio Valvassori, Giorgio Bonomi stated that ‘living and working in an area close to the border has strongly marked his work and life’; in an interview Roberto Kusterle stated that the space in which he lives is important, and he spoke about the ‘strong Central European heritage, a certain type of vision, the use of thick black [...]. The history still runs through our veins’. The story of Franco Dugo starts with inspiration from the east. At the beginning of his painting and engraving career the painter and graphic artist Jiří Anderle was as much in the artist’s thoughts as Rembrandt. Dugo admires the precision and the callousness of the line with which the Czech artist explored the darkest sides of humanity in a dimension beyond time, and his boldness, with which he revealed the truth in a surrealist manner and without any censorship, which can be unpleasant to say the least. In Rembrandt’s works he observed the technique, the masterful game of light and shadows, the capability of descending deep into the human psyche, all of which Dugo repeated in his work, starting with self-portraits, which have been registering the passing of time throughout his life. The photography in the work of Robert Kusterle is a means that erases all borders between truth and pretence and mixes them so they can no longer be distinguished; it becomes impossible to say what is real and what is not, as everything has been changed into what could have been. 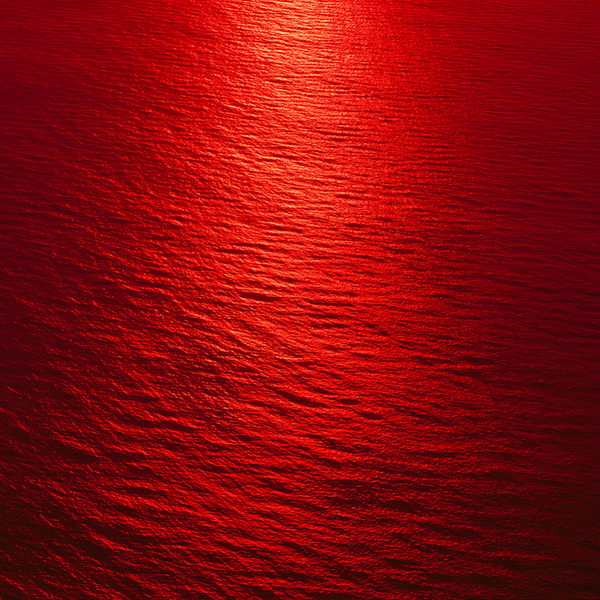 The technique and the contents represent the red thread that connects the work from the previous years with his newest works: the artist shows continuous interest in the relationship between man and nature. Nature finds the artist almost by chance as he strolls along the seashore or along a river embankment. In this case nature is represented by the soil, water, stones and everything that is moved, shaped and changed by water as these changes in the form inspire new worlds and new stories. Giorgio Valvassori offers a game of opposites, for which he chooses elements, materials and forms that are linked to the essence of geometry and space, fabric and wood, iron and lead. The forms call into mind situations, the objects interact with the space and the viewer, the sculptures and installations encourage a different perception, which destabilises the mind by contrasting the appearance of everyday reality and playing with antimonies, irony and drama, lightness and heaviness, the concept and materiality, with ambiguity in general. The photographic exhibition NON-SPACE│ZeroSPACE establishes various states which, with photographic crops as momentary brakes, fragment and process the dynamics of time. The sea surface changes into a rhizome surface of endlessly multiplying creases, which transform the topographic preciseness of the shot into an area of contemplation and a symbolic plane of expanding time and infinite space. However, the zero space is not merely a space of the ontological end and closure, in the same way as the black in the Black Square is not blindness or invisibility, but a system of dark lights or the glittering of darkness as we know it in certain rare moments when we close our eyes. The notion of the zero space as the antithesis of the space that Cvetkovič follows through the surface and light, is not so much something outside, in the landscape, as it is behind the wall of our eye. The exhibition Near Light emerged from the artist’s minute intimate, sensory and rational impulses to create a dialogue with an extremely enticing and demanding exhibition space. Petra Varl created a spatial choreography between four basic elements, which play with the artist’s and visitor’s experience of material reality and subtly connect it to the possibilities of the fleeting and transient. Through this the space is exposed to suspense between the material and something which is on the edge of the material presence, between the visual and non-visual. We are witnesses to a ‘liberation’ within the exhibition which emerges from combining elements that cannot be formally merged. Rather than with the physical inertia of mass or volume, which would fill the demanding exhibition space, the artist’s individually introduced elements are open and dynamic and try to break down the feeling of weight and volume and in this way show the simple beauty of the void within an architectural space. The exhibition Near Light is not merely a sincere derivation of the artist’s rational thought on the exhibition space, but also an intimate short story which reveals thoughts that are always split between experience and non-experience. The artist’s as well as the visitor’s. The exhibition features works of famous authors of German and Czech expressionism, such as Ernst Ludwig Kirchner, Emil Nolde, Karl Schmidt-Rottluff, Käthe Kollwitz, August Brömse, Emil Filla, Josef Čapek, Bohumil Kubišta, Otto Gutfreund and others, which will be placed side by side with works by Slovenian expressionist artists, such as Božidar Jakac, France Kralj, Tone Kralj, Veno Pilon, Fran Tratnik, Nande Vidmar, Drago Vidmar and others. The exhibition was created in cooperation of Božidar Jakac Art Museum with the GASK - Gallery of the Central Bohemian Region, Kutná Hora (CZ). 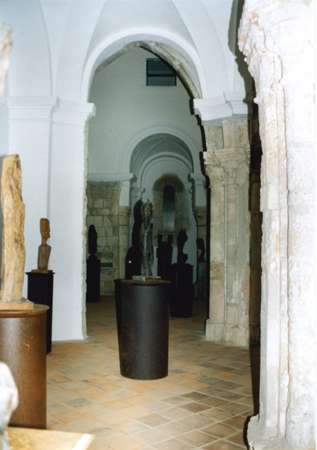 The exhibition presents works from: Božidar Jakac Art Museum, GASK - Gallery of the Central Bohemian Region, Kutná Hora, IFA - Institut für Auslandsbeziehungen, Kupferstich-Kabinett, Staatliche Kunstsammlungen Dresden, Kunstforum Ostdeutsche Galerie Regensburg, The Museum of Modern Art in Ljubljana, Museum of Contemporary History of Slovenia, The Pilon Gallery, Maribor Art Gallery as well as from private collections. 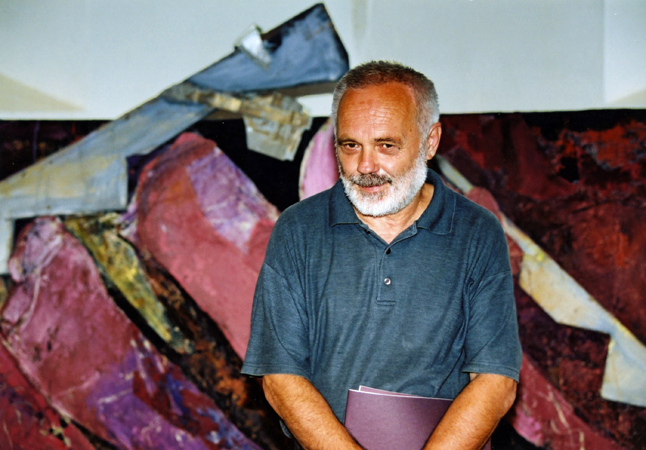 The first major posthumous overview of works by Slovene graphic artist and art educator Bojan Golija (1932-2014) offers an opportunity for a comprehensive evaluation of the artist’s exceptional and varied opus. 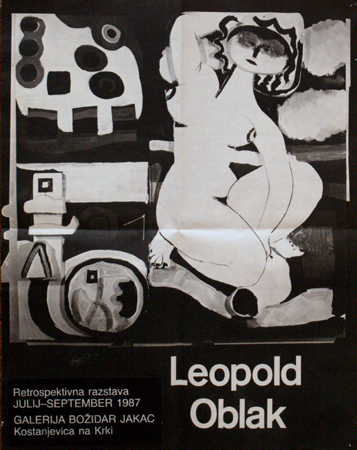 Studies under the mentorship of Božidar Jakac, and a formative journey to Japan in 1957, inspired a life dedicated to the explorations of the possibilities of graphic arts, and devoted to visual arts education at the Faculty of Education at the University of Maribor. The exhibition was created by Umetnostna galerija Maribor in cooperation with the International Centre of Graphic Arts in Ljubljana, University of Maribor and Faculty of Education at the University of Maribor. The exhibition Nature to the Sky, Man to Himself is an interactive combination of Austrian (post)modern painting and contemporary literature. The selection of landscapes and figural paintings, predominantly portraits, includes the key representatives of the Austrian painting pantheon of the 20th century, such as Herbert Boeckl and Maria Lassnig as well as the individual and diametrically opposed Werner Berg and Arnold Clementschitsch. The first part of the exhibition focuses on Marko Pernhart, the first Slovene realistic landscape painter. The depictions of nature and man are combined by quotes by numerous poets and writers from Carinthia and the broader Austrian milieu, including Valerie Fritsch, Alexander Peer, Gabriele Kögl and Maja Haderlap. Nature to the Sky, Man to Himself motivates the visitor to create personal stories on the image-text relations and question the relationship between man and nature, history and personal experience, the bodily and the spiritual, the province and the centre. At the same time it is a panoramic overview of the major periods, orientations and movements in 20th century Austrian painting. Alongside the Carinthian Museum of Modern Art in Klagenfurt, from where the canvasses originate, the following institutions participated in the exhibition: Robert Musil Literature Museum, The Slovene Writers’ Association in Austria, Carinthian Writers’ Association and the Austrian Cultural Forum. Slovene artist Tina Dobrajc in her solo exhibition titled Big Girls Don’t Cry, presents recent paintings and multimedia works, focused on the current political situation, the national mythology and gender issues. On her canvases, in mixed techniques, the artist depicts imaginary places and scenes that serve as a metaphor for everyday phenomena in the world that surrounds and leaves its marks on her. suit human needs, as it was in the case of the Bauhaus. In just fourteen years from its foundation, the Bauhaus became much more than a school. It became a humanistc model for the future, which is far from being exhausted, even though it will soon be over 100 years since its beginning. Walter Gropius was not only a founder of the Bauhaus, but is also considered by many to be one of the founders of modernist architecture. As the authors from the Bauhaus fall within the same time frame as the pioneers of Slovenian Expressionism, whose art collections are being kept and presented in the Božidar Jakac Art Museum, we are delighted to have the possibility to combine and present in our new exhibition area the exhibition Černigoj / Theatre from Škofja Loka Museum and works from the Marie-Luise Betlheim Collection, which were part of a large exhibition Bauhaus – Networking Ideas and Practice (BauNet) in the frame of international research project BauNet, organized by the Museum of Contemporary Art in Zagreb. In this way the Slovenian artist August Černigoj (1898 Trieste - 1985 Sežana) is put into context of active Bauhaus artists, during the period when he himself had intensive contacts with this influential school. neum from Graz, the Academy of Fine Arts Sarajevo and the Škofja Loka Museum. The aim of the project was to thoroughly research and present the activities and interaction between the artists from the south-eastern region of Europe, who studied at the renowned international school for architecture, design and visual arts – the Bauhaus, their impact and influence on artistic practices in the south-eastern region of Europe in the fifties and on the legacy of avant-garde movements. 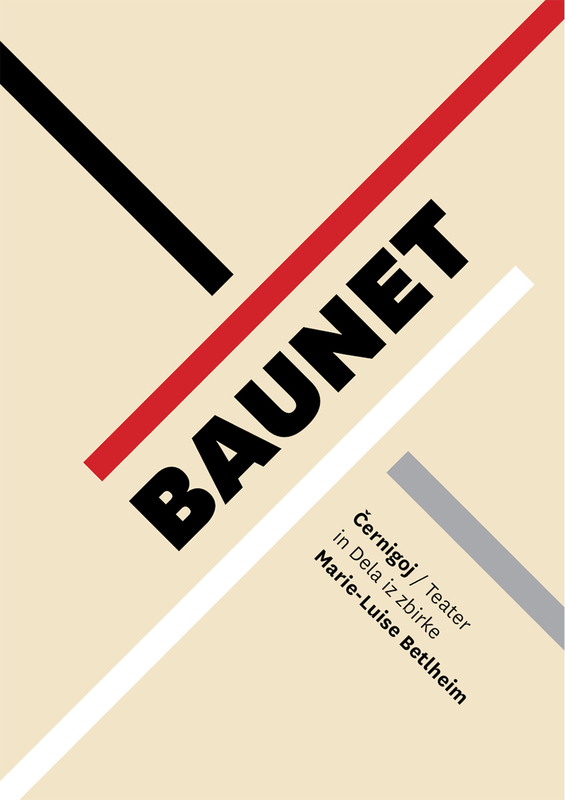 The BauNet project was supported by the EU Culture Programme 2007–13. The work of Ana Pečar traces the hidden layers of an ancient knowledge. The present corpus of video works and photos pulls its inspirations from textual and visual materials collected by Pavel Medvešček, more precisely from testimonials of the Old Faith among the Slovenes living in the Posočje region. The selected recording locations trace the sites presented in the narratives. The ambience of The Spring of St. Mary Monastery in Kostanjevica resonates the watery essence of the Krka river surroundings. Drawing from the old layers of culture, which are mostly related to sexuality and fecundity, the spring, understood as Mary’s attribute, acts as the pivot for the available, refreshing, living water, indispensable for life and prosperity. The author has created an atmosphere that rouses the inherent forces of the landscape, challenging us with pulsations of a suggestive, golden glow of water. 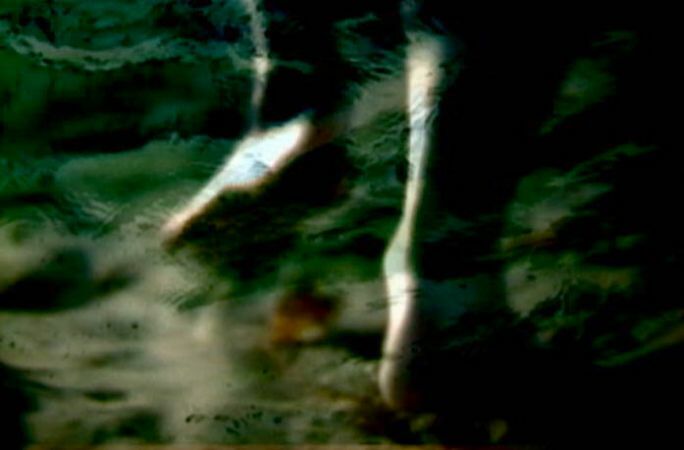 Artistic focus is on water in its dimension as the medium of light. It seems to be a magical mirror: despite allowing the gaze to penetrate it quite smoothly, it nevertheless spherically mirrors up and down and all the in-between layers on the light-shadow spectrum, materializations of a co-movement visible to the eye. 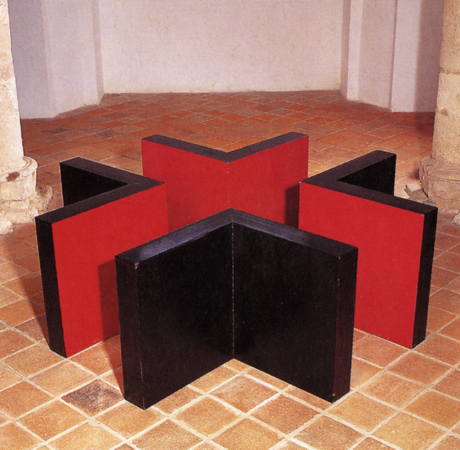 This retrospective offers a review of Valentin Oman’s work over the past fifty years. Oman‘s impressively extensive oeuvre concentrates predominantly on painting and graphic arts, with particular emphasis on intricate, experimental expansion and combination of these artistic resources; his themes are human existence and the question of being, transience and transcendence. 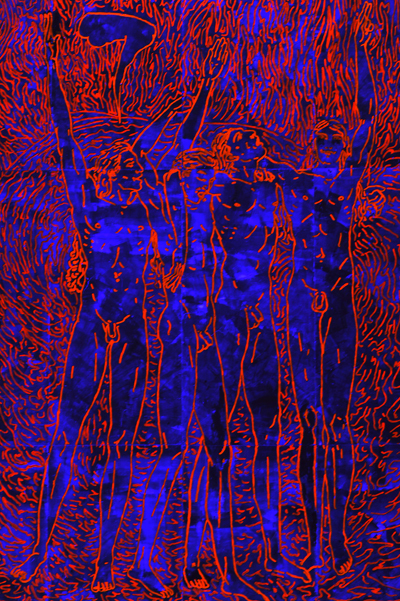 He has developed a distinctive pictorial vocabulary centered on the human figure and realized in exceptional techniques and evocative materials that formulate the figure as a symbol of a self-transcending metaphysical dimension. It appears, apart from traditional graphic works, in complex murals, material pictures and collages, and sculptures of metal and glass. 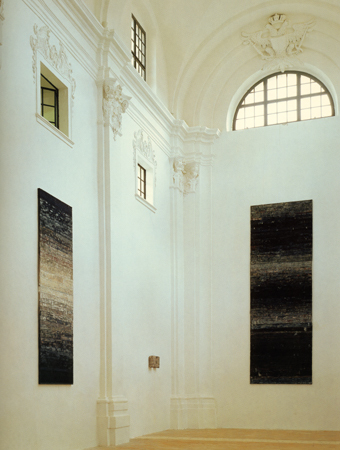 This exhibition has collected examples ranging from the 1960s to today, including works from the Hermagoras Collection and the Carinthian Museum of Modern Art (MMKK); there is also a variety of travel sketches and landscapes, documentations of his countless works for public space, and an installation referring to his commitment to bilingual place-names in Carinthia – a particular concern of his, since he belongs to the Slovenian ethnic group. Showing subsequently in the Carinthian Museum of Modern Art, the Vienna Künstlerhaus and the Božidar Jakac Art Museum, the exhibition is accompanied by a publication of 226 pages, with copious illustrations and essays by Martin Traxl, Milena Zlatar and others, in German, Slovenian and English. 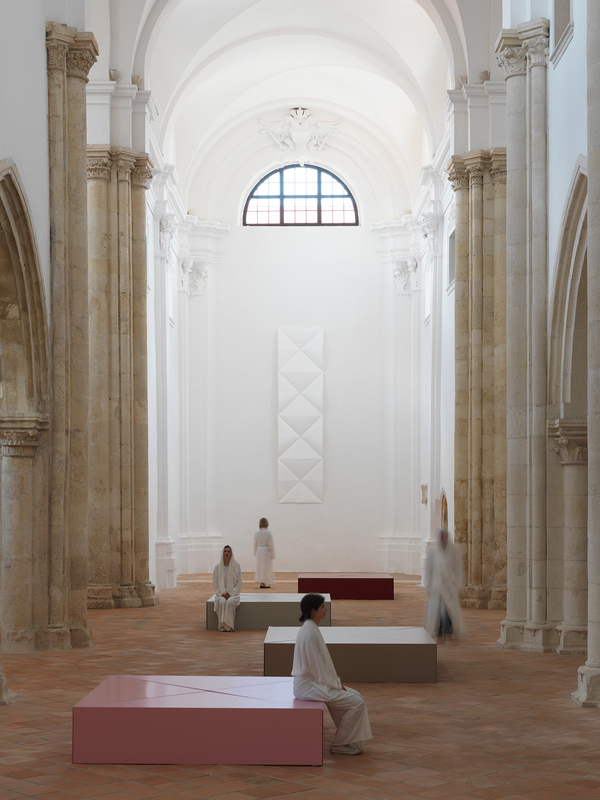 Mirko Zrinšćak (1953, Volosko, Croatia) has placed nine monumental wooden sculptures – whose pronounced verticals create subtle effects – in a dialogue with the space represented by the former monastery church. 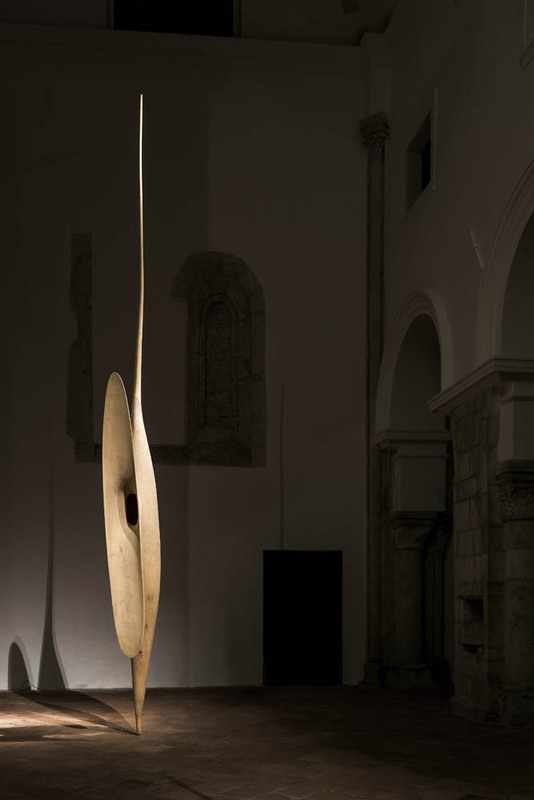 In the right light, these sculptures appear to float in space. In terms of content, the works are a continuation of the exploration of sculptural form begun by the artist in 2008 with the installation of his exhibition Forms of Space in Zagreb’s Art Pavilion. 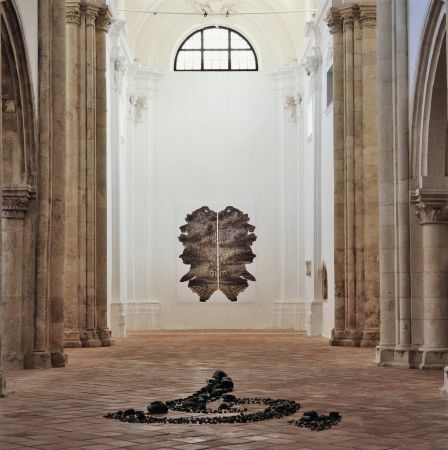 The artist continues his search for the ideal form, which in his words is a sublimation of all forms of his own personal archipelago, in the former monastery church in Kostanjevica na Krki. This search should be understood as the artist’s intimate meditation and search, which in Zrinšćak’s case is not a method but rather derives directly from his way of life, wholly dedicated to sculpture. This is why we can also understand Zrinšćak’s sculptures in the field of the sublime as an artistic statement based on experience. Any kind of insight requires profound attention from the viewer, a kind of haptic state in which an instinctive desire for tactility appears, when in the silence we start to pick up vibrations that we then feel somewhere in our gut, and hear the sounds of timelessness, when from far back in the past we also hear the here and now. 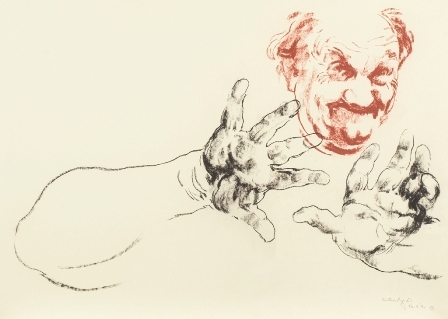 As artists, Milan Erič and Zvonko Čoh particularly excel in the medium of drawing. The exhibition in Kostanjevica, entitled Yearning for Light, betokens a shift in their work from drawing installations featuring unusual, clever and even improvised combinations of drawings that take shape through a dialogue with the space to installations in space. The installation at Kostanjevica is a comprehensively formulated ambience inspired by the architectural and symbolic logic of the space; at the same time, as an art intervention it subverts it and translates it into a different experiential zone. 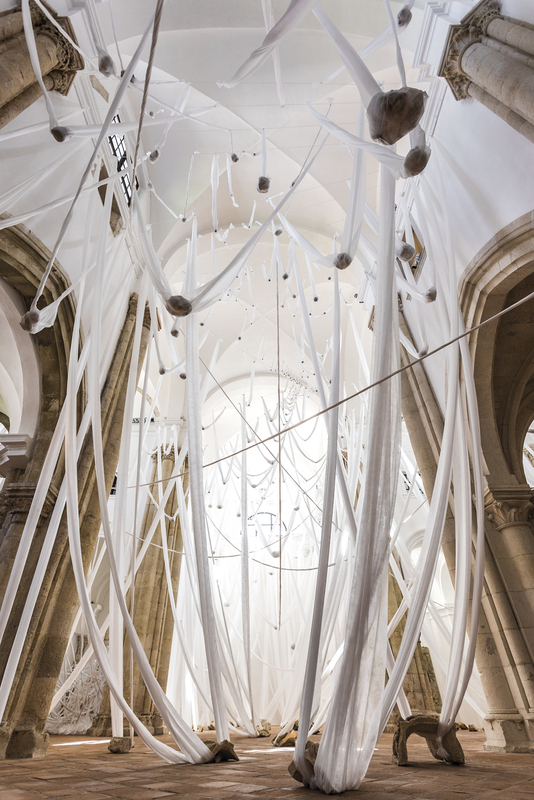 In the space of the monastery basilica, the artists created an alternative architectural situation by hanging and unfurling translucent white strips from the ceiling and walls. It is as if they are drawing on air. Forming a meshwork, the strips fill out and set in motion the otherwise vacant church space. On the one hand, their structure keeps time with the rhythm of the architectural elements: the pointed arches and the sheaf-like columns and arcades; on the other, it retains its own unique interplay of forms. What does the Marjan Gumilar exhibition at the Kostanjevica church show and tell us? Stations of the Cross in painting. The process of how a painting goes through phases of suffering, cutting and torture, so that only through extreme reduction, on the verge of abstraction, does it achieve a sublimity that is a match for the times, that climbs upon the altar and goes beyond. In order to reduce the painting to its fundamental components, Gumilar does not need to cut it or multiply it, for indeed its Stations of the Cross are evident within the painting. Then the process that can already be perceived within the individual painting is then externalised into the space and divided into individual sequences. At the moment when you put together (more than) two paintings, when you initiate (at least) two cuts, you are not faced simply with the issue of the spatial neighbourhood (left, right) and temporal sequence (before, after), but primarily and firstly with the issue of beyond: physics is hollowed out by metaphysics, the world can find in itself the cut to the sacred. 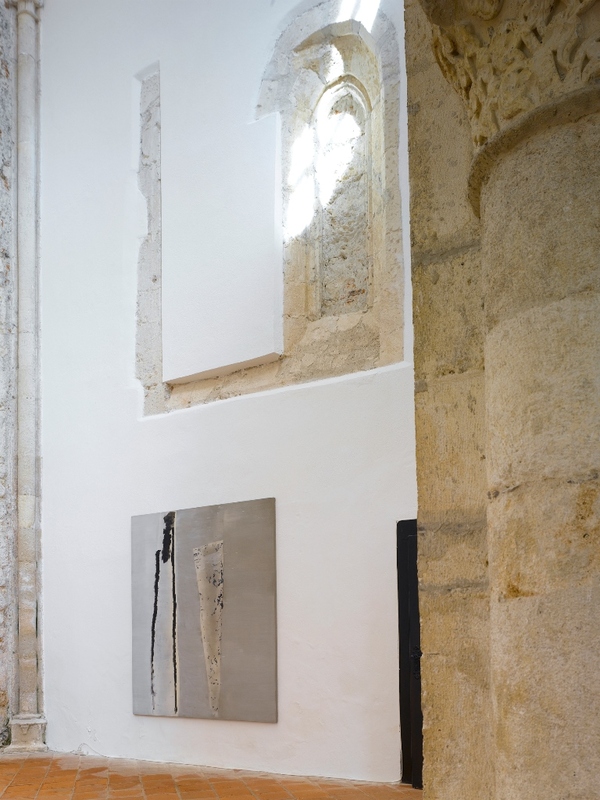 On the empty altar of the Kostanjevica monastery church, Marjan Gumilar’s paintings are reduced to their fundamental components: black, white, brush stroke, plane, light, glint – and our view. The church is turned on its head here, since in the holiest place of its rituals it does not place god-the artist, but the believer-viewer. Tomislav Buntak (1971, Zagreb, Croatia) — academically trained painter and lecturer at the Painting and Drawing Department of the School of Arts in Zagreb. He is considered to be an idiosyncratic artist and a representative of the almost forgotten genres of fantastic realism and symbolism, due to his complete dedication to traditional artistic disciplines, representation and exotic themes. 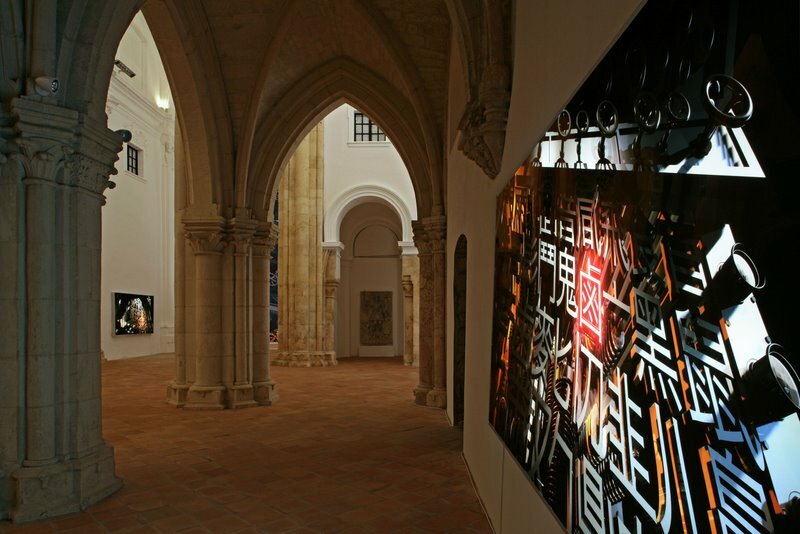 His cycle of monumental drawings, A Journey of Encouragement, unorthodoxly interpreting biblical themes in fluorescent colours within the baroquified romantic architecture of the desecrated former church, is a glorious example of his trans-generational, trans-culturological and trans-religious creation. ‘Body. Made in me’ exhibition tackles the „irony of the industrially produced commodities for mass consumption, marked with the tag of origin. It emphasizes the uniqueness and unrepeatability of the image whose creation Abram personalized to the extreme limit and at the same time managed to avoid the aura of Art, the mythization of creativity; the image of the body even in my own body remains the product of pure optics in combination with chemistry. This has been achieved by Abram improvising the camera obscura in his mouth thus changing his very mouth into a photographic device which we might want to call camera oralis. The traces if incidences left by the process on the little piece of photosensitive paper became the constitutive parts of the image,“ as observed by Andrej Smrekar, PhD, who contributed opening introduction and essay accompanying the catalogue. 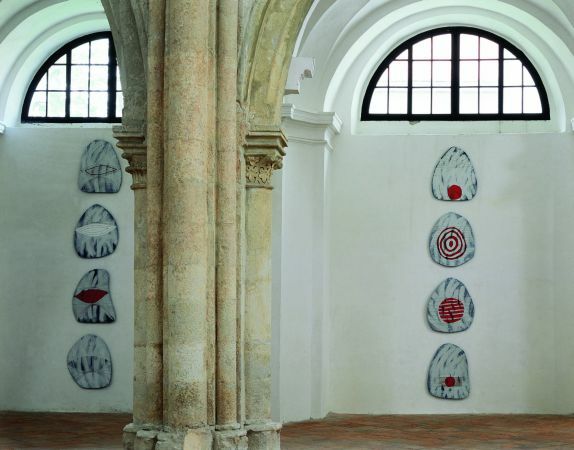 Zmago Lenárdič (born in1959 in Ljubljana), academic painter, Professor at the Academy of Fine Arts and Design, Ljubljana, presented his work at the site-specific exhibition in the Former Monastery Church, entitled Second Life. In its very title, the Second Life exhibition takes us on the road of the Internet and its virtual possibilities. Specific expression of the artist’s visual poetic is rooted in the tradition of Modernist Art. 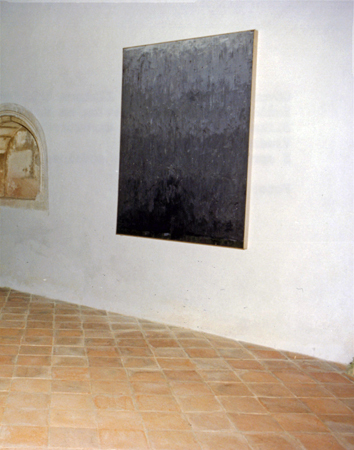 In the exhibition installation we follow his investigation of the painting as an object and perception of a visual field – the subjects that essentially occupy him throughout his career. The artist introduced the vibrancy of stained glass windows into the abandoned colourlessness of the church. 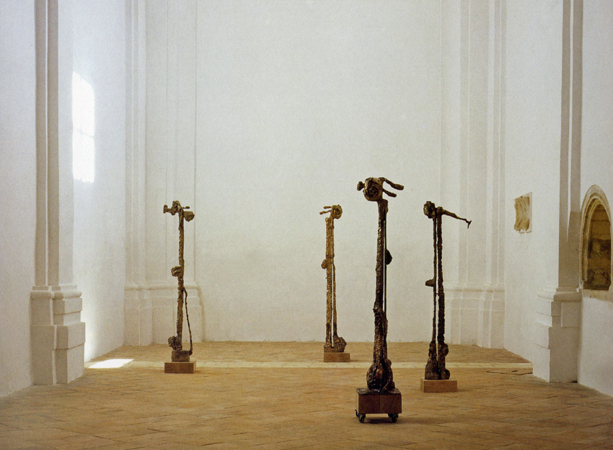 Mirko Bratuša has prepared an exhibition for the gallery in Kostanjevica, housed in the former monastery church, and called the sculptures Hypocrites. 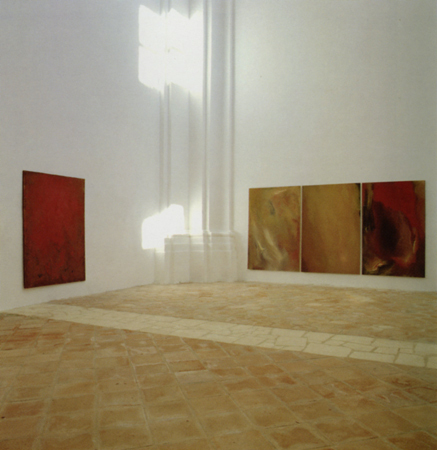 In the case of the artist who is sensitive to the subtlest nuances of the spaces for which he prepares his exhibitions, the choice of theme was certainly dictated by the energy written into the church by time and the purpose for which it was built. But as it is generally characteristic for his work, he has not submitted to the usual, majority conception of this once-sacred space and instead has intuitively sensed its numerous other functions and, with his inexhaustible imagination, impressed them on the Hypocrites. Site-specific installation presented artist whose painting work has from the very beginning been based on reflecting and examining the medium, its potential for expression, medium specifics and the issue of representation or the emergence of the image. 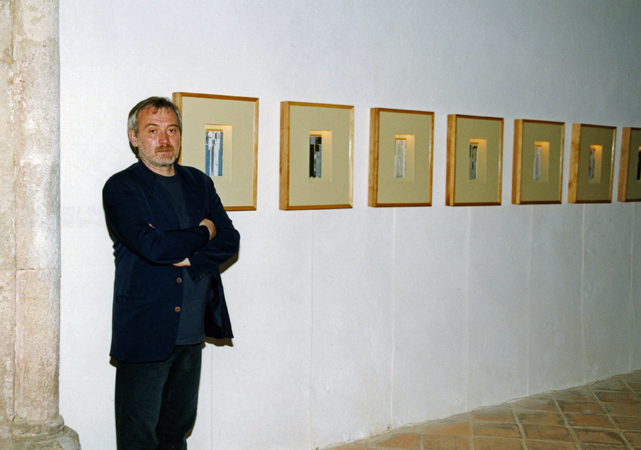 Essay accompanying the catalogue had been contributed by Tomislav Vignjević, PhD, the exhibition’s curator. Bojan Gorenec graduated at the Academy of Fine Arts in Ljubljana in the class of Prof. Marjan Pogačnik and Prof. Jože Brumen in 1979. 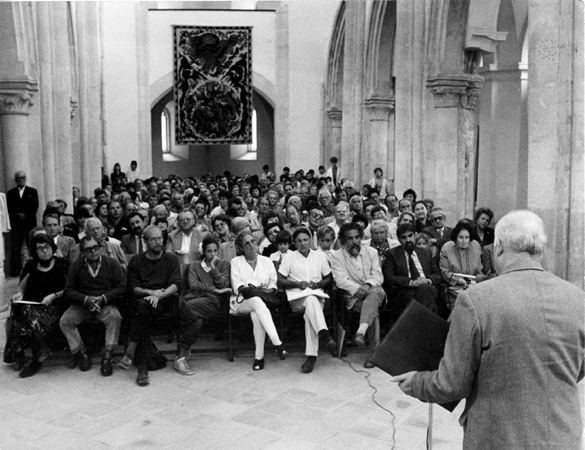 He had been awarded the Prešeren Foundation prize in 1990. „The mind set and art of the Middle ages have always been discretely present in Barišić‘s works. 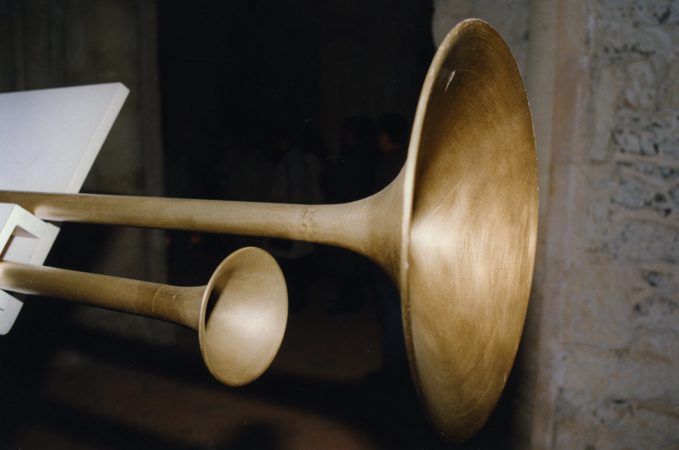 In his early sculptural accomplishments, he evoked romantic art and now, after almost two decades of dealing with the form reduction and the problematic of geometrical forms, he found himself once again in the medieval space ...“ as exhibition’s curator Mladen Lučić observed in an essay accompanying the catalogue and at the exhibition opening. When Zlokarnik exhibits paintings full of primary colourfulness, they are a contribution from an artist who is experiencing intensively current times and pondering them deeply, while at the same time she is emotionally observing and grasping history. In this way she recognises that each colour is a self-aware personality with an extraordinarily rich and changeable physical, spiritual and symbolic past,“ as exhibition’s curator observes in the essay accompanying the catalogue. Opening programme featured opera singer Zdenka Gorenc, accompanied by pianist Nataša Valant. 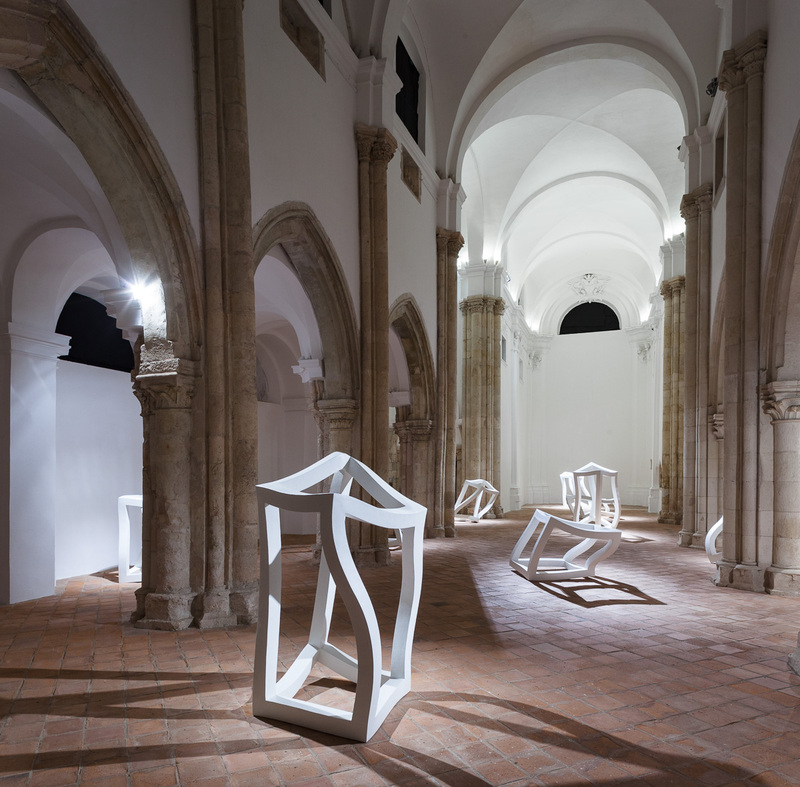 Inside the Gothic Church, Šimrak placed nine translucent objects, introduced by 10-meter long digitally printed sheet in presbytery. The 10 objects are entitled ‘Cybermachine’, with the subtitle ‘Corps sans organe (body without organs). Exhibition can be attributed with exceptional subtleness and up-to-datedness in the present era. According to many theoreticians, the present era is strongly marked by transition from industrial to information society . 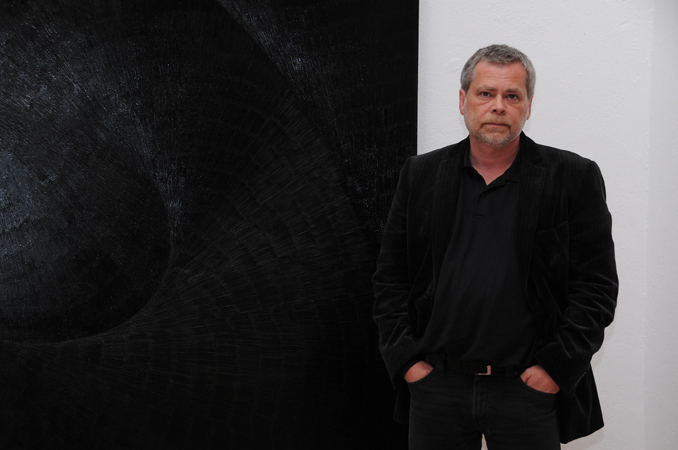 In the observation of exhibition’s curator Robert Inhof, director of Gallery of Murska Sobota, who had contributed the essay accompanying the catalogue, the artist „carefully considered set-up where the sacrality of the space and the sacrality of his black paintings would be mutually supportive“. 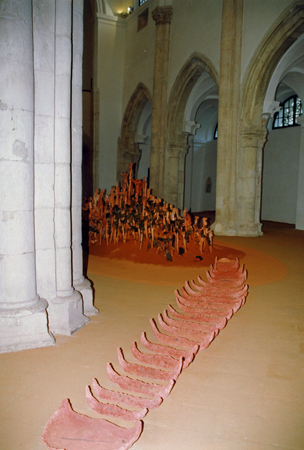 In this site-specific installation, Slak used „the principle of unified spatial design, and with his relief and colours, which introduce a specific pulsation into the constructed ambience, he achieved a unique atmosphere inspired by the culture of the Far East and, last but not least, filled the sacred space with energy,“ observed exhibition’s curator Barbara Rupel in the essay accompanying the catalogue. Opening programme featured members of the SEATA music band: Aleš Gasparič/ flute and whistle, Lado Jakša/ blowpipe in keyboard, Boštjan Perovšek/ computer and ambiental sound, Jože Slak/ percussion in Miloš Bašin/ percussion and traditional instruments. 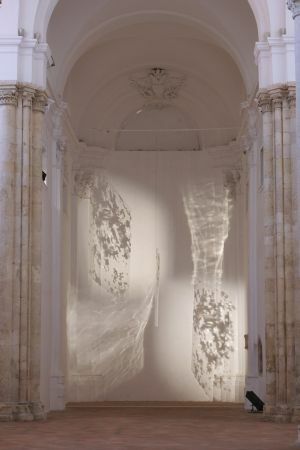 In her site-specific artistic installation Uršula Berlot studies the behaviour, response and perception of the viewers in the exhibition space and encourages associative games with the help of the organic shapes produced by reflections of light through compositions on transparent supports. 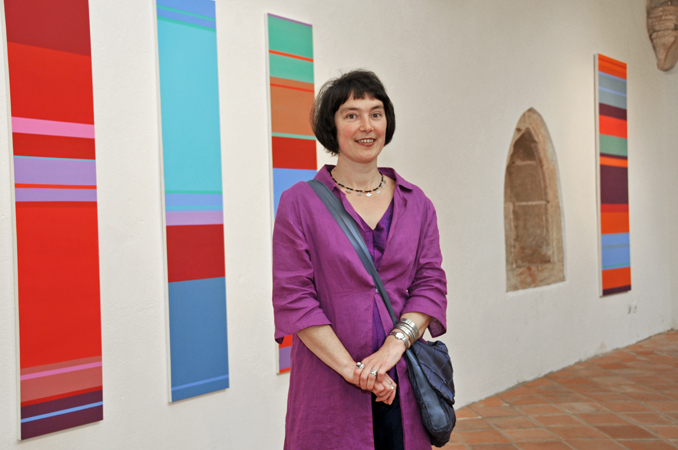 Essays accompanying the catalogue had been contributed by Barbara Rupel, who also curated the exhibition, and Nataša Petrešin. 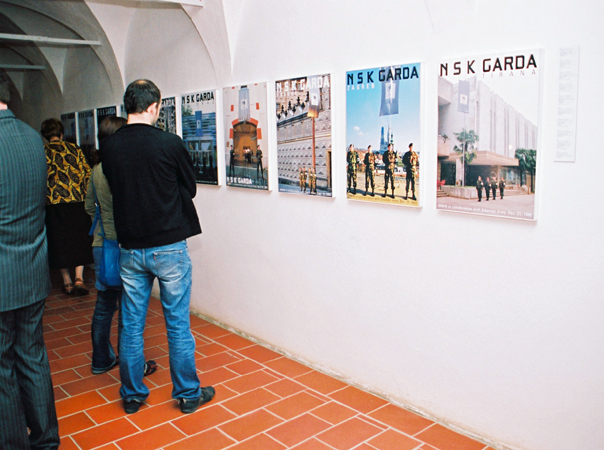 Exhibition had been a part of SPOT 2006 project, a result of collaboration between House of Photography – Slovenia, Republic of Slovenia Public Fund for Cultural Activities and Božidar Jakac Art Museum. Exhibition had been curated by Marina Gržinić and producted by House of Photography. Participating artists: Tomaž Gregorič, IRWIN, Jane Štravs and Aleksandra Vajd&Hynek Alt. 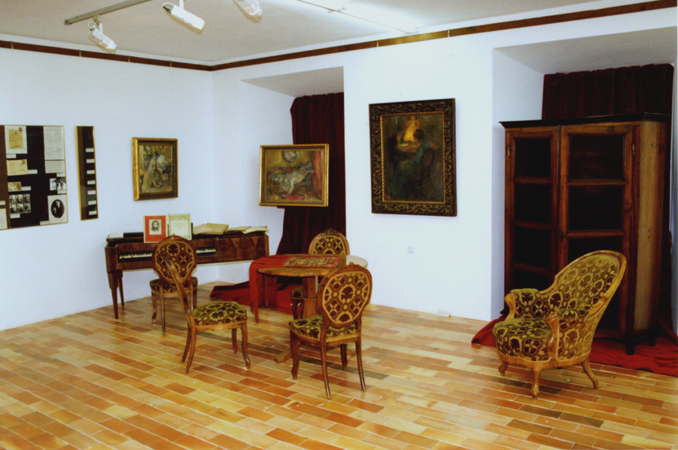 Exhibition took place in eastern wing of the Božidar Jakac Art Museum’s first floor. Site-specific installation of the artist who ‘combines all possible scenic, artistic and theatrical elements which thus affect our senses in synaesthesia.’ Essay accompanying the catalogue had been contributed by Jure Mikuž. 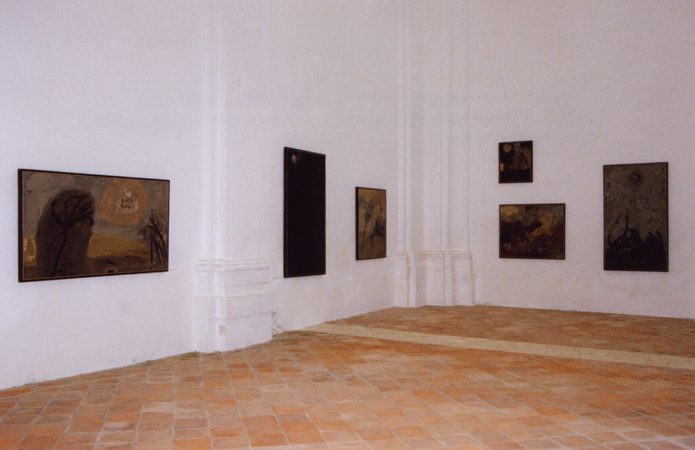 Painting exhibition in the former monastery church, dedicated to the academic Tomaž Brejc. Essay accompanying the catalogue had been contributed by Tomislav Vignjević, PhD. Site-specific installation of artist’s recent paintings. 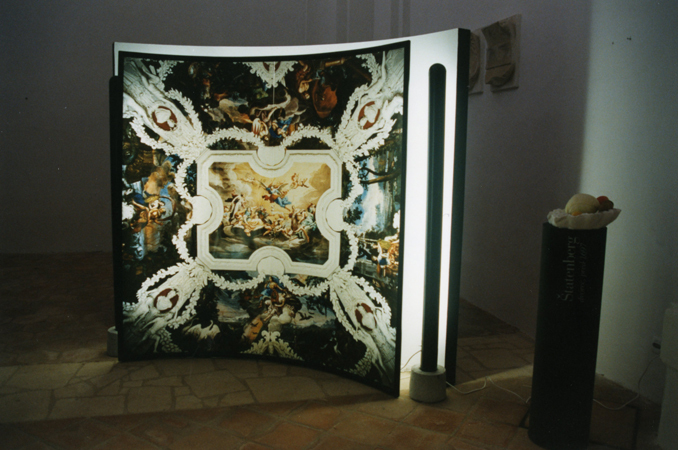 In presented series, „Marinč submitted his conception of the installation to the original function of the sacred space, he made use of the medieval eschatological organization of spatial experience“, as Andrej Smrekar, curator and author of accompanying essay in the catalogue, accentuated. 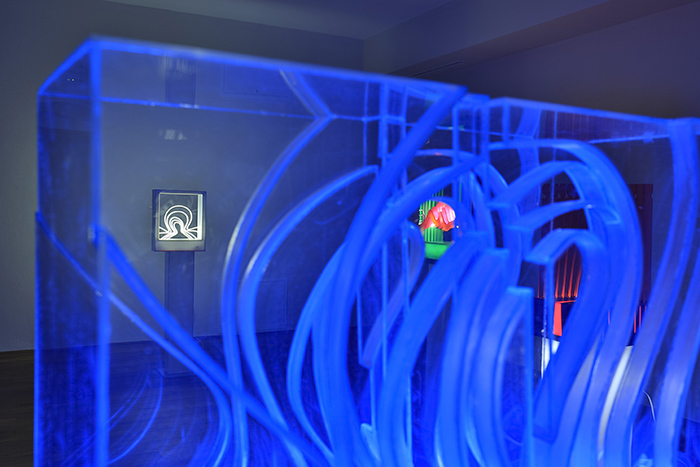 The blue-lavender segment of the colour circle that dominates in the installation components elicits a more spiritual effect. The opening programme featured All Capone Štrajh Trio. Engaged, site-specific installation of artistic tandem who have been exhibiting together ever since their student years and the consequent graduation in 1991, which entailed a public painting and sculpting event at the Tivoli Park pond in Ljubljana. 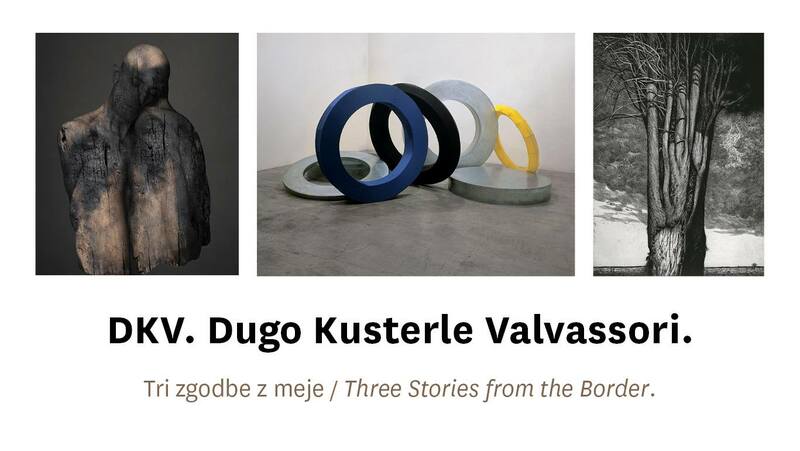 Opening introduction and essay accompanying the catalogue had been contributed by art historian Vojko Urbančič, the exhibition’s curator. 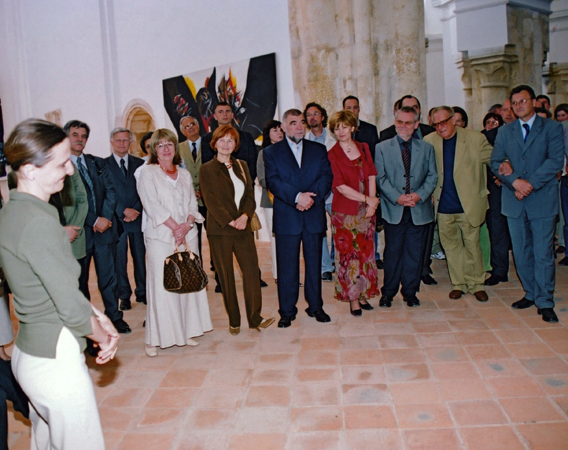 During the exhibition, artists performed Workshops which had been taking place throughout May 2004. As director of Maribor Art Gallery and exhibition’s curator Meta Gabršek Prosenc put it in the essay accompanying the catalogue, Rimele’s paintings act as ‘light chasers’. The opening programme featured cellist Karmen Pečar. 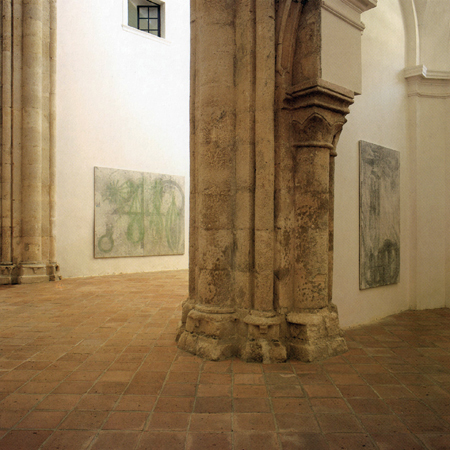 The display features works by Croatian painter, made between 2000 and 2002. 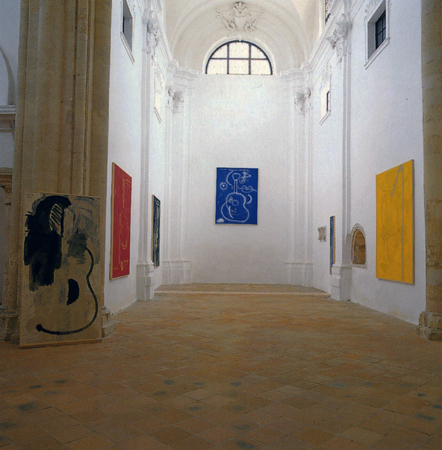 Some of the works had been influenced by the specific site of a Former Monastery Church. Essays accompanying the catalogue had been contributed by Zoran Kržišnik and Katja Ceglar. 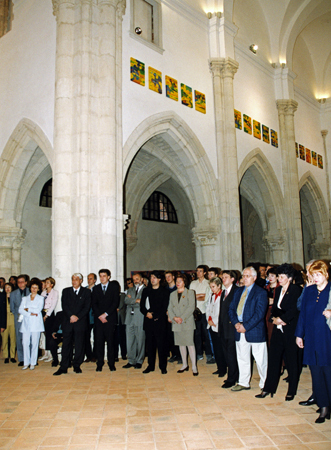 The exhibition opened in the presence of Stipe Mesić, president of Croatia, and Croatian prime minister Ivica Račan. Official opening speeches were held by Minister of Culture of Republic of Slovenia Andreja Rihter and Minister of Culture of Republic of Croatia Antun Vujić. The accompanying programme of the opening featured mucisians Igor Lunder with Reeds and Tamara Obrovac with Ante Gelo. 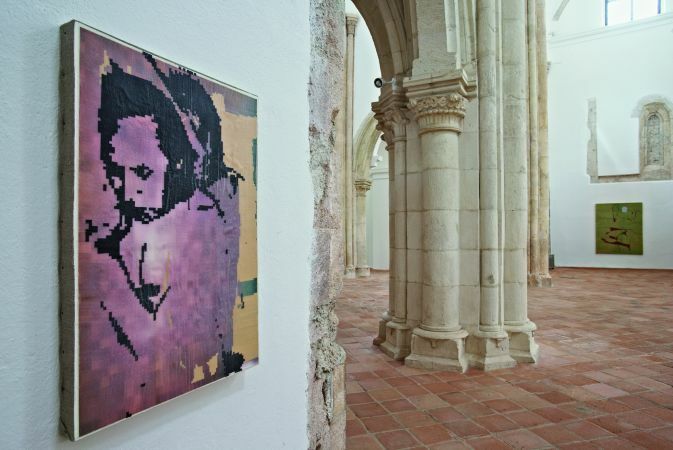 Site-specific painting exhibition in Former Monastery Church. Works had been introduced by curator Andrej Medved, PhD. 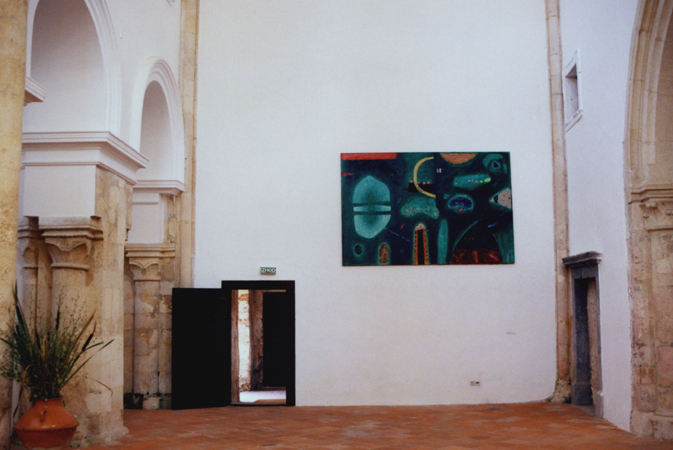 Specific set-up inside the Former Monastery Church and at the courtyard of the Božidar Jakac Art Museum. Texts in the exhibition catalogue were written by Andrej Medved, Miklavž Komelj, Vesna Velkovrh Bukilica and Bryan Lauch. At the opening of the exhibition, the author and his work were introduced by Andrej Medved. An exhibition of paintings, drawings and sculptures. The catalogue text is written by Gorazd Kocjančič, a philosopher and translator from classical and modern languages. The catalogue is accompanied by the essay written by Igor Zidić. 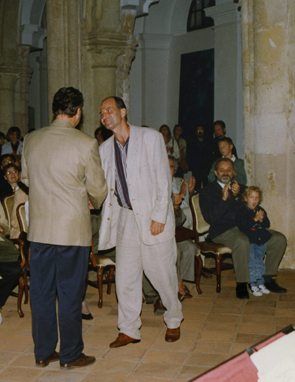 The opening of the exhibition featured Drago Arko on violin. 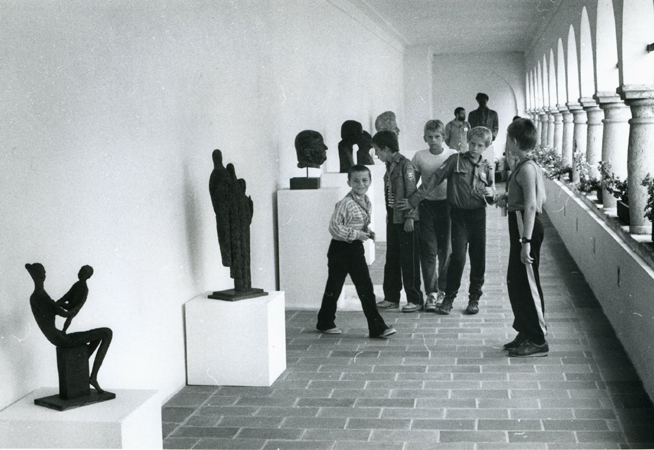 Exhibition of sculptures. In the essay accompanying the catalogue, Nadja Zgonik, PhD describes them as „tiny, marginal themes; the shapes of statues are reminiscent of the plant and animal world ...“. 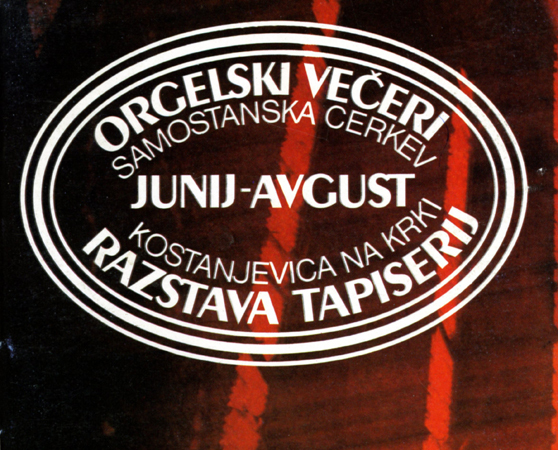 Accompanying programme featured Ljubljana Octet, conducted by Igor Švara. Exhibition of works, made in recent two years. As Nadja Zgonik observes in the essay accompanying the catalogue, „ the new miniature works of art are the logical continuation of Vrezec’s exploration of small composite entities“. 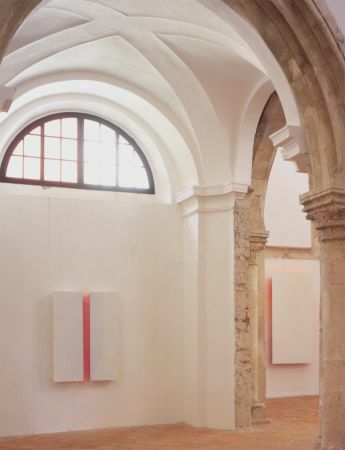 In his site-specific installation, Vatroslav Kuliš „considered the given exhibition space as a dynamic space of meaning, as well as the possibility for a highly relaxed formal play of colour textures,“ as observed by Marko Košan in an essay accompanying the catalogue. In the presence of Culture Minister RS Jožef Školč, Anton Vujić, PhD, Culture Minister of Republic of Croatia, officialy opened the exhibition. Accompanying programme featured Zagreb Quartet. 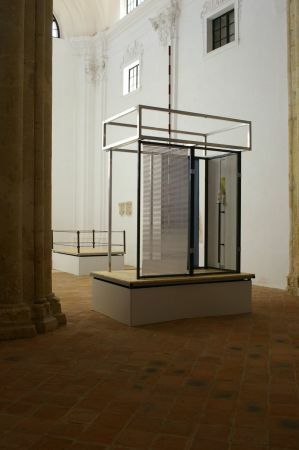 Site-specific installation in the Former Monastery Church „is a continuation of Begić‘s interventions in the same site. 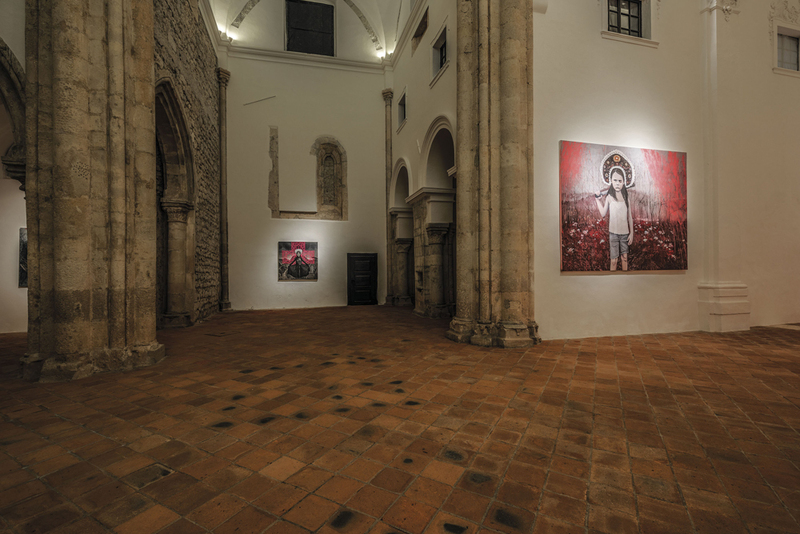 The Whole, presented in this site-specific installation in numerous details, linked to the reliefs on the wall; captured in eloquent, yet timeless, web of red dust on the Church floor,“ as observed by exhibition’s curator Andrej Medved. Opening speech had been delivered by the Minister of Culture RS, Jožef Školč. 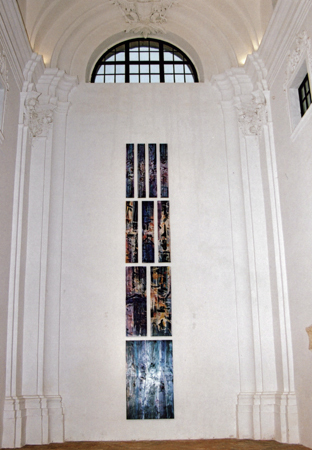 Site-specific installation by academic painter who graduated in the class of Professor Gustav Gnamuš at the Academy of Fine Arts. Under the mentorship of Gnamuš, he also completed his Master studies. 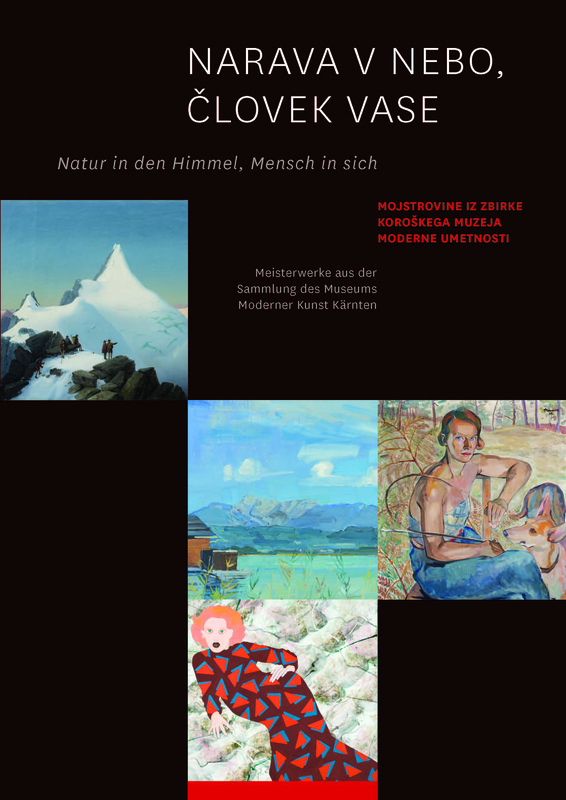 Opening introduction and essay accompanying the catalogue had been contributed by the director of Slovene National Gallery, Andrej Smrekar PhD. Accompanying programme featured Volodja Balžalorsky / violin and Igor Saje / guitar, performing works by Vivaldi, Iberto and Paganini. Borčič‘s latest series of paintings, in the opinion of exhibition’s curator Jure Mikuž, “fuses life experiences and conveys them through a large theme of the space in which he has spent a major part of his life”. The opening programme featured harpist Mojca Zlobko. Exhibition of American Graphic entitled Turning the Century accompanying The 5th Biennial of Slovene Graphic Arts. Sculpture exhibition. Opening introduction had been contributed by Marko Košan. Accompanying programme featured saxophonists Aleš Suša and Lovro Ravbar. Exhibited Vita Peracta cycle „is thematically based on Huzjan’s concerns with philosophy of personalism“ observed exhibition’s curator Katja Ceglar. Essays accompanying the catalogue had been contributed by Katja Ceglar and Marko Košan. Guest exhibition, prepared by Slovene National Gallery. Accompanying programme featured Mojca Zlobko / harp. 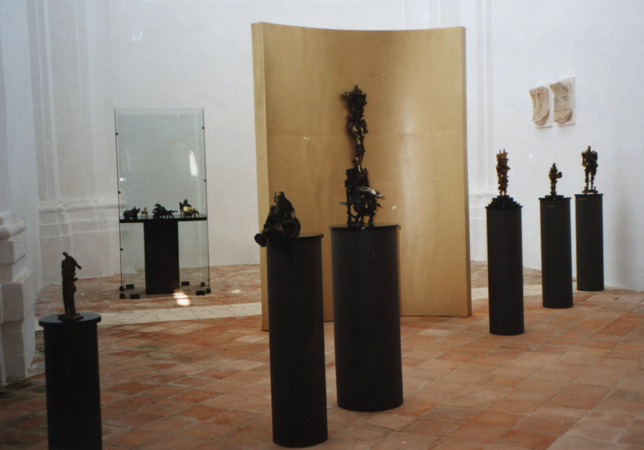 Exhibition of sculptures. The artist had been introduced by Andrej Smrekar, director of Slovene National Gallery, exhibition’s curator and author of the accompanying essay in the catalogue. The opening programme featured wind trio Slowind. 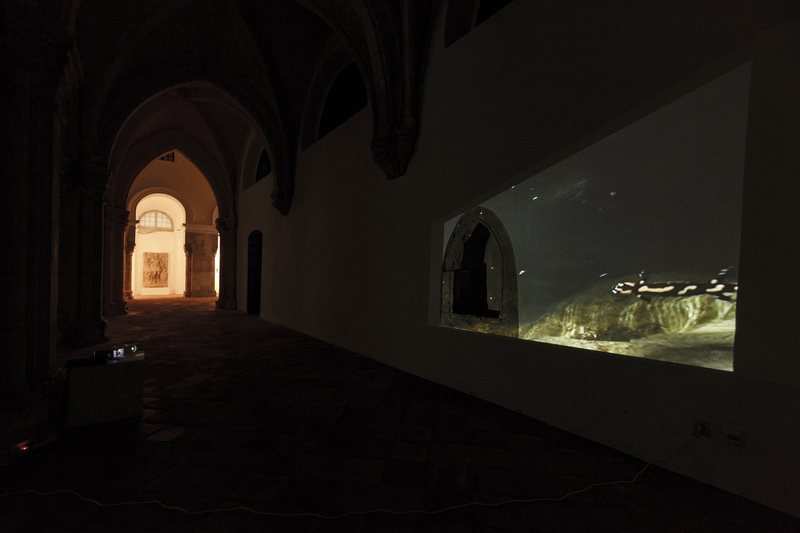 Joint project of the Božidar Jakac Art Museum and the Coastal galleries, Piran. 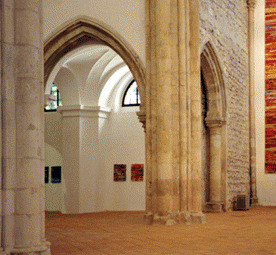 The exhibition took place at four different sites: Former Convent Church and Lamut’s Art Salon of Božidar Jakac Art Museum, Piran Town gallery and Meduza gallery in Koper. The artist had been introduced by Bojan Božič, director of Božidar Jakac Art Museum, Andrej Medved, art director of the Coastal Galleries, Pira, and Prof. Konrad Oberhuber, director of Albertina, Vienna. The opening programme featured Vienesse violinist Victoria Marino. Exhibition of most recent landscape paintings by Croatian painter. Opening introduction and essay accompanying the catalogue had been contributed by Vladimir Maleković, director of Muzeum of Arts and Crafts, Zagreb. Accompanying programme featured Studenček Octet from Celje. Exhibition presented the most recent landscape paintings which could be, in the opinion of exhibition’s curator Andrej Medved, characterised as „artistic screens, in which the creativity of work seeks a new paysage, long lost to the modern“. 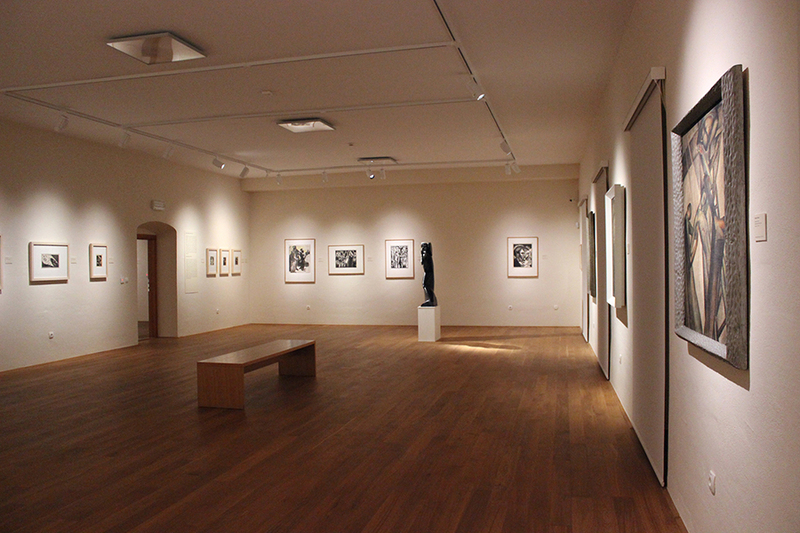 The exhibition is a result of collaboration between Božidar Jakac Art Museum and Piran Coastal Galleries. Opening introduction had been contributed by Andrej Medved. Accompanying programme featured Mojca Zlobko / harp. Retrospective exhibition. 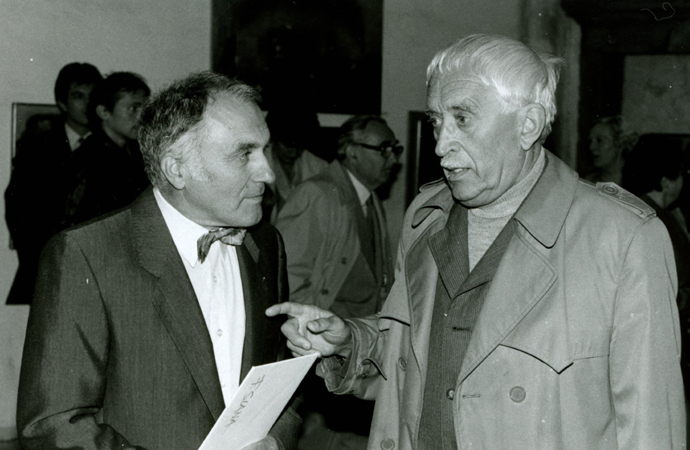 Opening introduction and essay accompanying the catalogue had been contributed by Lev Menaše, PhD. Accompanying programme featured members of wind instruments Quintet Dolenjska. 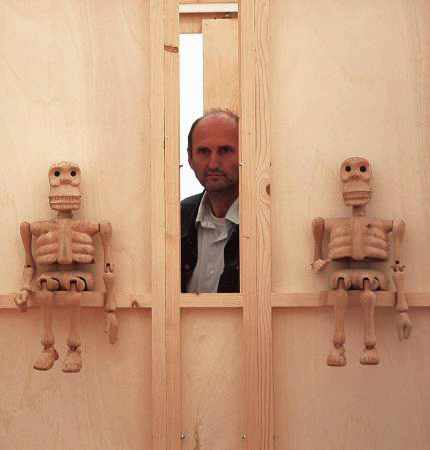 Exhibition presented wooden sculptures by artist which sculptural oeuvre „is produced on a double margin: in the contemplative (self) isolation and in a continuous, often bitterly accentuated dialogue with his social environment,“ as remarked by Ivan Sedej, PhD, the author of essay accompanying the catalogue. Accompanying programme featured Ljubljana Saxophone Quartet: Primož Flajšman, Betka Kotnik, Jure Cizej and Aleš Suša. Exhibition presented works by young artist. Opening introduction and essay accompanying the catalogue had been contributed by Milček Komelj, PhD. Museum and gallery installation of works by Rihard Jakopič, curated by Dragica Zadnik Trobec, Janez Kos and Andrej Smrekar. 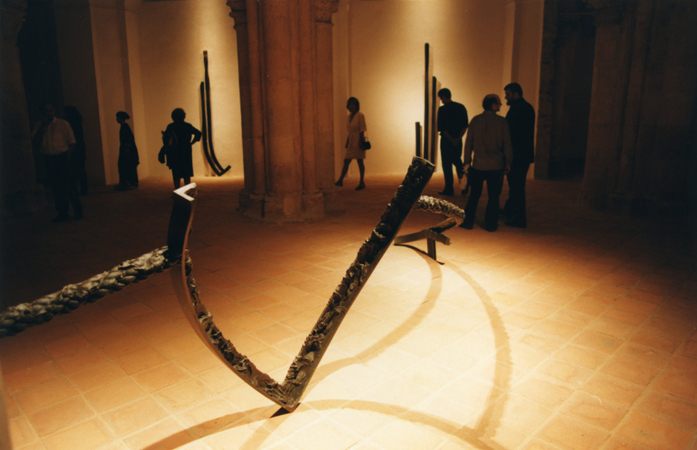 Installation created by Dušan Kramberger. At the opening, the museum-related work had been introduced by Gregor Moder and Dragica Zadnik Trobec, while Andrej Smrekar held the presentation of the gallery-related involvement. By exhibition’s opening, The Božidar Jakac Art Museum celebrated Statehood Day. Official opening speech had been delivered by the director of Slovene National Gallery, Andrej Smrekar, PhD. Accompanying programme featured MPZ Brestanica, conducted by Janko Avsenak. Exhibition marked the occasion of artist’s 60th anniversary. Accompanying programme featured Ljubljanski madrigalisti choir, conducted by Matjaž Šček. Retrospective exhibition had been officially opened by the President of Slovene Parliament, Milan Kučan. 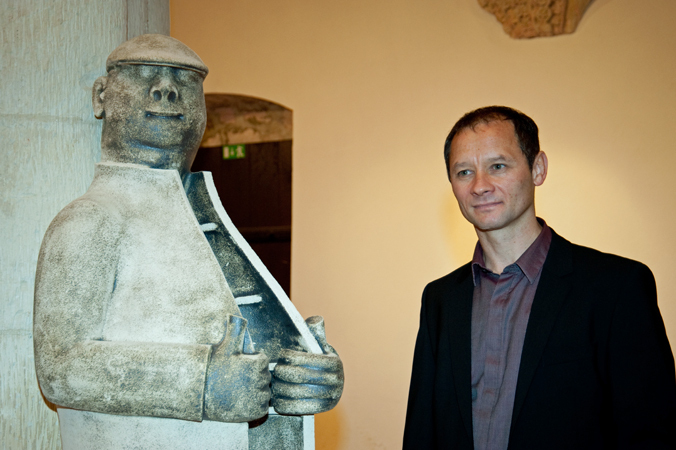 Artist had been introduced by director of City Art Gallery Ljubljana, Aleksander Bassin. Accompanying programme featured Chamber Orchestra: Sabira Hajdarević (alto), Jurij Reja (tenor), Tone Grčar (trumpet), Tibor Kerkeš (tromba) and Borut Lesjak (keyboards) performing works of Darijan Božič Intrada 90 and Pagan Hymn, both written especially for this occasion. Exhibition presented works by the artist who, after graduating from The Academy of Fine Arts, Ljubljana, went to live and study in Munich. Essay accompanying the catalogue had been contributed by art historian Franc Zalar. Opening speech had been contributed by Matjaž Kmecl, PhD. Accompanying programme featured Slovene Octet performing programme of renaissance, spiritual and folk songs. Oil painting exhibition celebrated painter’s 60th anniversary. 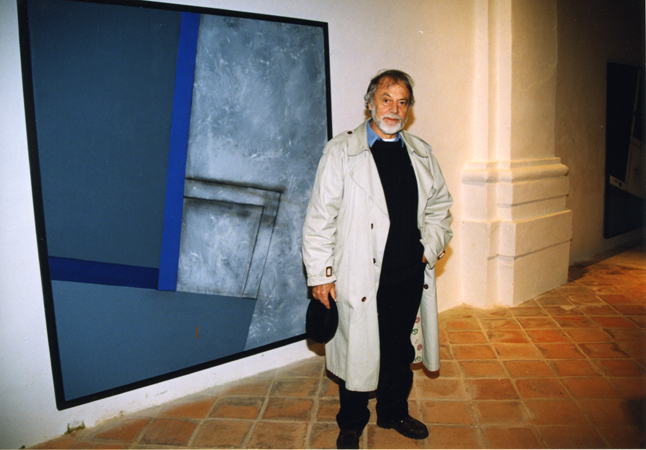 Artist and his work had been introduced by art historian Janez Mesesnel. Exhibition had been opened by president of the SRS assembly Miran Potrč. Accompanying programme featured APZ Tone Tomšič, conducted by Jernej Habjanič. In the photo: France Slana and Igor Torkar. Exhibition presented works, donated to Kostanjevica na Krki and its people by the artist. 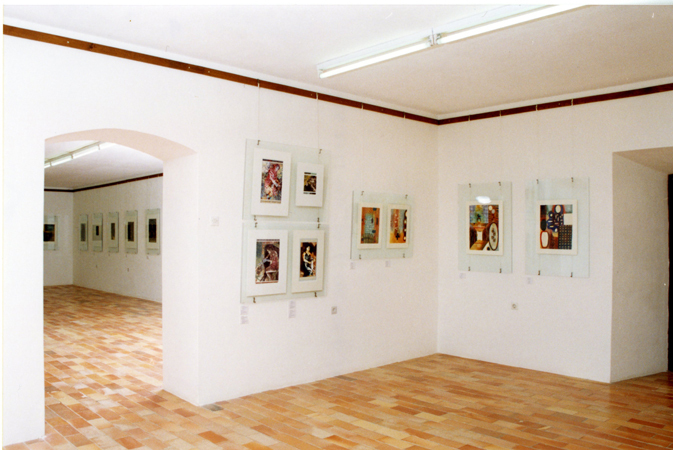 Works had been presented on the arcade corridors of Božidar Jakac Art Museum. Exhibition presented tapestries. 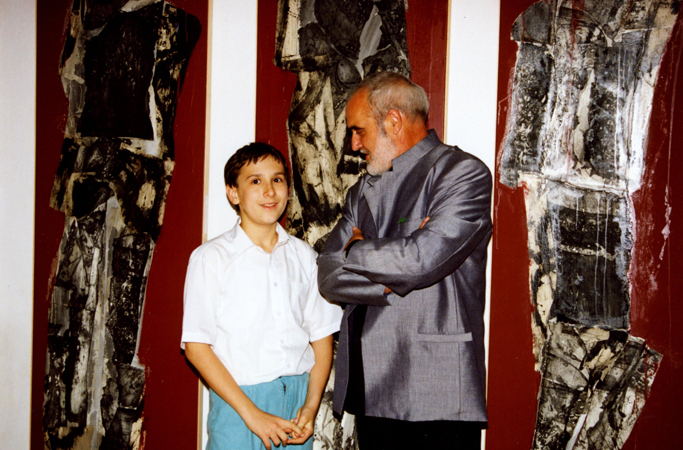 Artist and his work had been introduced by Zoran Kržišnik. Opening speech had been delivered by Lado Smrekar. Accompanying programme featured PAZ Vinko Vodopivec (conducted by Borut Smrekar) which performed jubilee concert in the honour of 750th anniversary of establishment and 200th anniversary of abolition of the Cistercian monastery. Tapestry exhibition. Accompanying organ evenings took place from June 26th, 1980 to August 1st, 1980.